ETTSI Incentive Premiums today announced the launch of their new Luxury Travel Fundraiser web site at LuxuryTravelFundraiser.com. The web site features 3 of ETTSI’s most popular high end travel certificates including their newly enhanced Condo Vacation Club Memberships and was developed specifically for the fundraising industry and optimized so that fundraising groups who are searching for the fundraising products they offer can easily find them. Like most everyone these days, fundraising groups prefer to search the internet to see what programs are available so you have to have a special web site that is designed just for that purpose. ETTSI Incentive Premiums, a licensed and bonded seller of travel for more than 19 years and a pioneer in the travel certificates industry, today announced the launch of their Luxury Travel Fundraiser web site at http://www.LuxuryTravelFundraiser.com. Fundraising is a multi-billion dollar business where fundraising groups are constantly seeking out the best fundraising products and programs. These products must present a high perceived value and a strong incentive to buy because fundraising groups typically use unskilled salespeople that need to easily gain the support of their friends and relatives to help them reach their goals. ETTSI’s travel certificates have consistently achieved excellent results for all types of businesses that use sales incentives so it’s not surprising that they have developed a following in the fundraising industry from groups that enjoy selling these types of products. Fundraising groups are much more difficult to market to because, unlike retail and wholesale businesses who have long term employees that are accessible during regular business hours, the fundraising group’s decision maker is usually a group member’s parent that works during limited free time and they tend to change roles frequently as their children grow up. Fundraising is quite seasonal so a year later when it’s time to follow up with the fundraising chairperson from before, their child has moved up to a different group and they are usually not in charge of fundraising anymore nor do they know who took their old job or who is in charge of the group in which they now belong. This makes it absolutely necessary to have a web site targeted to fundraising so as to stay in front of these groups. 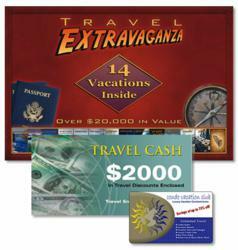 The web site features 3 of ETTSI’s most popular high end travel certificates: Travel Extravaganza which offers 14 travel certificates totaling over $20,000 in value, the Travel Cash Booklet with 26 travel coupon from $25 to $100 totaling $2000 in value, and the newly enhanced CondoVacationClub.com memberships where members can search over 130 travel vendors on ETTSI’s 8 travel search engines for travel arrangements at wholesale prices. Also included on the web site is a description of the fundraising program and the opportunity to register a fundraising group and place fundraising orders online with any major credit or debit card. For groups that wish to pay by check there is a downloadable check order form as well. Fundraising groups may visit the web site at: http://www.LuxuryTravelFundraiser.com for additional information. A color brochure is available to download and print and there is a form you can submit to have an ETTSI Fundraising Counselor assist you. For more information about ETTSI and their broad range of Travel Certificates, Incentive Premiums and Employee Rewards, please visit http://www.ETTSI.com, or you can contact Frank Bertalli at PR@ETTSI.com or call 1-866-224-9650. ETTSI (Executive Tour and Travel Services, Inc.) is registered in the states of Florida, California and Nevada as a Seller of Travel. FL#ST22752, CA#ST2065118-40, NV#2006-0132, offering a full service travel agency as well as many travel and cruise packages in the form of travel certificates. For more than 19 years ETTSI has lead the sales incentives industry with unique programs and products always striving to meet the needs and exceed the expectations of the sales organizations they serve. Through the sale of their certificates, ETTSI provides travel accommodations to 1000's of travelers each year garnering them preferred pricing and preferences with airlines, motels, and many other travel related services. Please visit http://www.ETTSI.com for more information about the company and its products and services.